On November 1, 2018, LSU Museum of Art will open George Rodrigue: the Cajun Landscape, an exhibition featuring early landscape paintings by Louisiana artist George Rodrigue (1944–2013). Rodrigue was born and raised in New Iberia, Louisiana, the heart of Cajun country. For more than four decades, Rodrigue sought to depict his Cajun heritage through his work. The oak tree was a primary feature inspiring many landscape paintings in the early 1970s, which evolved to include Cajun people and traditions, as well as his interpretations of myths such as Jolie Blonde and Evangeline. 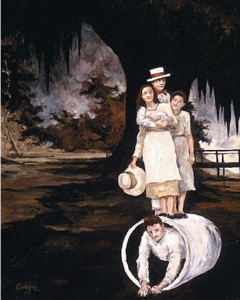 This exhibition organized by LSU Museum of Art in collaboration with generous lenders including the George Rodrigue Foundation of the Arts, Paul and Lulu Hilliard University Art Museum, the Haynie Family Collection, and Louise Ganucheau. Wendy Rodrigue will be at the LSU Museum of Art for a Gallery Talk on November 4th, as well as participating in education outreach at several Louisiana A+ Schools, as part of her ongoing George Rodrigue Life and Legacy Tour .